Who Really Murdered Holly Wells and Jessica Chapman? Revelations that a US soldier was the killer would have jeopardised public support for the “War on Terror”. Hence a frame-up was required. A Joe Vialls classic recovered. Iranian Defense Minister Brigadier General Hossein Dehqan announced that the Russian S-300 missile defense system which was delivered to Tehran by Moscow recently has been deployed and integrated into the country’s missile defense network. “The S-300 system has been delivered and a part of it was deployed,” Rapporteur of the Iranian parliament’s National Security and Foreign Policy Commission Seyed Hossein Naqavi Hosseini quoted General Dehqan as saying in his Tuesday meeting with the Commission members in Tehran. Naqavi Hosseini also said that General Dehqan had underlined continued projects to design and produce different radars and satellites by the defense ministry experts, reiterating that the country wants to keep up advancements in the field. Iran announced on Wednesday that the new defense systems integrated into the country’s home-made missile shield have increased its air defense capability. “Integration of the indigenized systems with the new systems has increased (Iran’s) air defense capability,” Commander of Khatam ol-Anbia Air Defense Base Brigadier General Farzad Esmayeeli said, addressing the Air Defense Base staff in Tehran only a day after reports said Iran has received the missiles of a battalion of the S-300 air defense system that it imported from Russia a few months ago. Esmayeeli underlined that the equipment needed in the Air Defense Base are built and supplied based on standing needs and requirements and future threats. His remarks came after reports said earlier this week that the first cargo of missiles special to the Russian S-300 missile defense system which was delivered to Tehran by Moscow in April has arrived in Iran. 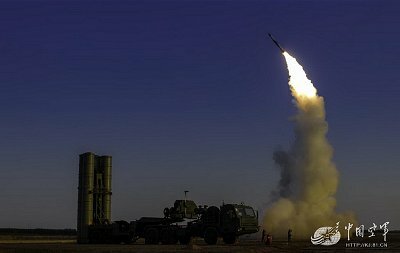 The recently-delivered missiles can be used in the S-300 PMU2 defense shield which is known as the most advanced and deadliest missile defense system in the S-300 family. According to the Russian arms manufacturer, the PMU2 needs only 5 minutes to prepare for action against hostile flying objects. The radar used in the missile shield, N6E Big Bird 64, can simultaneously identify 200 targets, trace 12 targets and send the information to the fire control radar.